Oh please. C&C1 missions are .ini files. Note: .ini files, WHEN LOADED CORRECTLY, are added to the registry. anyone can use the extension .ini. however, when loaded the way it was DESIGNED (in Win16), Windows added the contents of the file to the registry. no, only .reg files are added to the registry, and only when you actually tell it to do so. While there are some system-related ini files (unrelated to the registry though; just related to the OS' booting mechanisms), you generally don't find them anywhere in My Documents. Pretty much ALL reasonably-sized DOS and Win95/98 era programs used ini files for their program configuration. It's not an operating system related thing, it's just a file format. And a very loosely defined one at that, too. I too was having difficulty setting up CNC Generals and Zero Hour. It took me several try's to figure it out. I see in previous posts a few different methods were used. My issue was my screen resolution. I copied the .ini file script and successfully saved the file as Options.ini and left the resolution in the script as 1024x768. I did not set anything as to run as Administrator or to run in compatibility mode. The main issue I had was my new laptop resolution is set to 1600x900, CNC Generals and Zero Hour only work on 1024x768. Once I changed my desktop resolution on the initial startup of the games using the ini file in both data folders the game launched. after running both games for the first time I was able to change my desktop resolution back to 1600x900. CNC automatically adjusted the resolution after that. Below is the script. Just copy and paste it into note pad and save it. Select all files for file format and type options.ini for the file name. Then copy and paste the file into the Generals and Zero Hour data folder located in the Documents folder formerly My Documents. I tried to run Generals(Zero hour) and i followed the instructions but it gives me a message that i need directX8.1 or above or that maybe my VGA is old however,i have directX11 and NVIDIA GT220 and i installed DirectX 9.0c full package and still no good,it's giving me the same message.I want to mention that my PC is Win7 32bit and not 64. The message says something else too... might be worth looking into which cards are supported by Generals. If I can run ZH on a GTX460, his GT220M should definitely work just fine. Just odd that it's bitching about DX8.1. Make sure that you are running the game at a resolution your monitor supports. Else the game will moan about DirectX versions for some strange reason. umm... isn't game.dat the game executable? I can't imagine how deleting that could solve anything. you have encountered a serious error. serious errors can be caused bye many things including viruses, overheated hardware and hardware that does not meet the minimum specifications for the games. If you have Windows Vista/7, refer to the first post of this thread. If you have Windows XP, see if you have the game properly installed and patched, if you have files leftover from a mod, and if your game has a sloppily cracked exe. Recently i installed from TFD, Generals Zero hour for some old good fights after i saw in you tube the Generals Trailer 1 at E3 that made me wanna revisit that game. 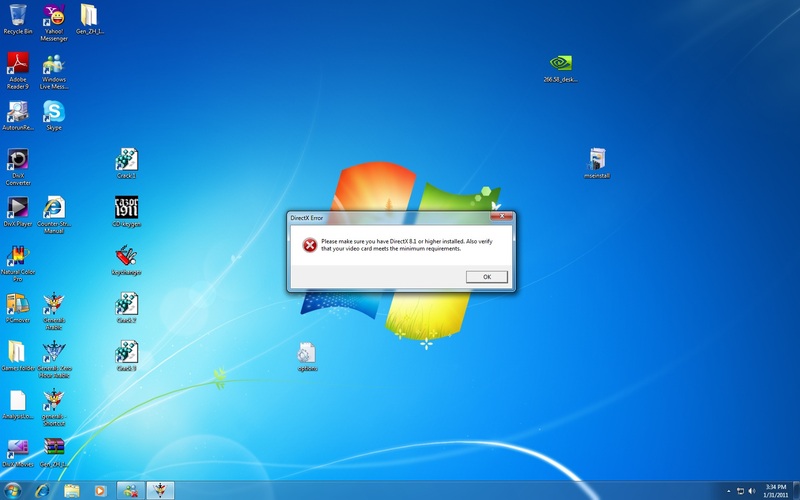 Now i am running Windows 7 x64 and after installation the program didnt run. in there go to "My Documents"
well there after trying to run the game you would see a Command and Conquer Generals Zero Hour Data folder. copy those lines inside and Save it! thats it go inside change your settings and restart the game. <object width="635" height="385"><param name="movie" value="
name="wmode" value="transparent"></param><param name="allowFullScreen" value="true"></param><embed src="
SO...I did exactly this, and it made the game (Zero Hour) open and run normally, right up to the point when I actually get past the menu and start playing. After I build just a few dozers and one building everything get blown to bits and I am told that I have been defeated. From what I understand this is a form of copyright protection for the game; if any files get modified the auto-defeat option turns on. If I remove the options.ini file from the data folder then the game glitches on the splash screen and we are back to square one. Any ideas? Win7 64 Ultimate, lots of power, legit game and legit game key. The same problem happened with Generals, but the options.ini file worked beautifully and I can play it no problem. I have reinstalled multiple times, manually deleting leftovers from the install each time, no effect. Anyone that can solve my problem has beer and a bed next time they are in Alberta! This glitch is common in RA2 too. Have you tried installing the game in a directory different than Program Files (I hear that it's quite a pest in Win7)? I have the same problem.. even tho i know my system requirments should be far beyond enough..
Im running Win 7 64bit.. and i did make the ini file and the maps folder, i tried to use these resolutions in the ini file, 800 600, 1280 1024, 1024 768. non of these seem to work.. or there must be another error or something.. I also allowed all the rights u could get in the security tab of the CNCGZH shortcut, and i put WinXpSp3 as compatibilitymodus, and im Running the porgram as administrator. so whenever i try to startup the game u see the beginscreen.. then when it goes away i get the error msg "you have encountered a serious error. serious errors can be caused bye many things including viruses, overheated hardware and hardware that does not meet the minimum specifications for the games. contact ea blablabla"
Alright, lads. First tell us if you tried anything from the first page of this thread, don't just spam new posts. -3. Disable Visual Styles (this disables the aero style of the Vista virus and win7). Seems you have a mod with a bug (mines.ini is not a regular Zero Hour file) Delete all mods, patch the game to 1.04, don't use sloppy No-CD cracks. You CAN downgrade DX. It's a must when playing older games (for instance, that is the only way you can play Star Trek Armada II on Vista/7). yes thats correct i had the error from the beginnin then i tried contra7 and the same error stayed...ok thanks ill try everything agian delete all files and reinstall all the files.., and also the dx9c.. ull hear again if it doesnt work.. cuz i wont stop msging untill this game works on my pc! I've tried many Options.ini, i have problem with DirectX8.1 despite I installed the lastest version. I changed the resolution: nothing. I've started with "run as an administrator": nothing. I have the blue windows "command & conquer", the screen change resolution, and then back to windows. I passed 2 hours, and it's not working. I really need it, we want absolutely do a LAN. i have problem with DirectX8.1 despite I installed the lastest version. Find DirectX 9.0c somewhere. It might work after that. DX 10 or 11 don't seem to run Generals. PLZ help how can i downgrade DX???? i have win7 and dx11 and it has got error all the time!!!!! !